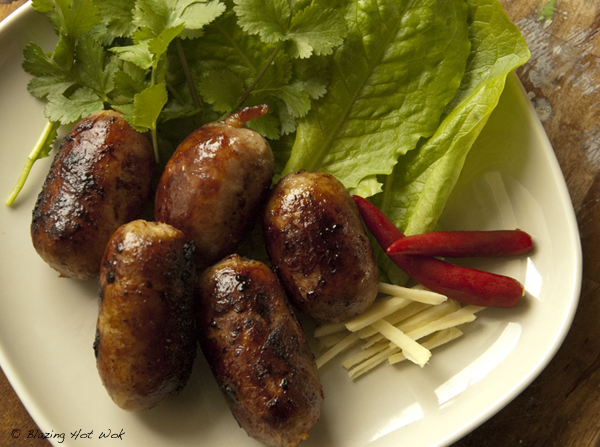 Blazing Hot Wok: New and Improved Isaan Sausages! Now with 100% More Fermentation! New and Improved Isaan Sausages! Now with 100% More Fermentation! When I began dabbling in sausage making a few years back, one of the first sausages I ever made was an Isaan-style sausage. At the time, I didn't feel confident enough to ferment it, but I've been working on it for the past few months and I thought I'd share the experience with you. Be forewarned that this is a lengthy read, but hopefully you will find the information useful. These fermented sausages are usually eaten as a snack or appetizer. I like to wrap them in lettuce leaves with a few matchsticks of fresh ginger, cilantro, Thai chili, and freshly toasted peanuts. Don't forget the ice-cold beer on the side! When it comes to Thai food, the first person I always consult is my mom because, well, she's the most awesome Thai food cook ever. She usually has an answer for me, but if not, Mom will consult her friends, a group of women from her temple I've lovingly dubbed The Aunties. They are always more than willing to give advice, on anything and everything, solicited or not. Concerning the fermentation of Isaan sausages, The Aunties had plenty to say. One suggestion was to put cooked sticky rice into a container, let it ferment, then add it to the ground meat. 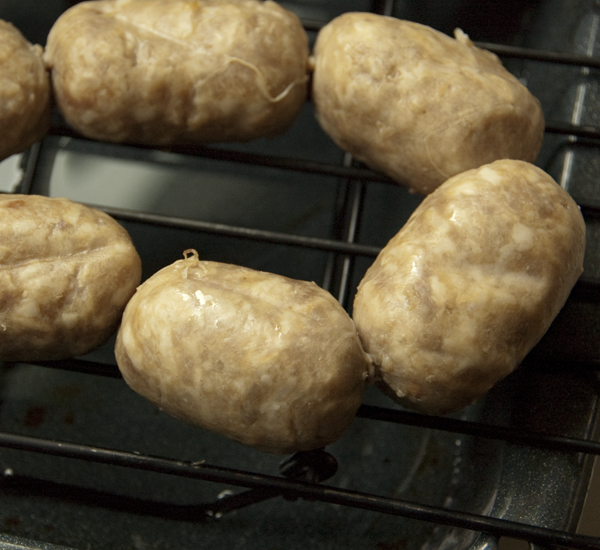 Another was to put the stuffed sausages into a Ziploc bag and let them ferment on the countertop. Then there's the "authentic" method of letting the sausages just hang outdoors and ferment naturally. None of the suggestions would be considered safe by today's standards, yet, as Mom pointed out, no one she has ever known has died from consuming authentically prepared Isaan sausages. I have ignorantly eaten authentically prepared Isaan sausages many times myself and I'm obviously alive to tell about it. Why didn't I ever get sick? Because, curing meat without food additives, like sodium nitrite or nitrate, can be done. Additives aren't as necessary when the food is going to be thoroughly cooked and properly stored. But with that said, if there's a way to reduce the risk of making my family ill, it's a no brainer to go that route. I'll touch a little on food safety because I think it's important and there seems to be so much conflicting information. It's common knowledge that ground pork left out above 40F for any significant amount of time will allow bacteria to flourish. That's not necessarily a bad thing when you're trying to ferment a sausage. The one we don't want flourishing is C. botulinum because it produces the toxin that causes botulism. Sodium nitrite, which is found in pink salt, will inhibit the growth of this bacterium to a large extent. Thoroughly cooking the fermented sausage will also help kill the bacterium and the heat will destroy the toxin it makes. The problem is, C. botulinum produces spores and these suckers are robust. Sodium nitrite and heat won't kill them. They can still germinate given the right conditions, like those found inside a sausage link, and if the concentration of sodium nitrite becomes low enough, the bacteria will thrive. Even after food is properly cooked, any remaining spores can still germinate and produce toxin. This occurs most commonly in improperly canned foods, but it also happens with fully cooked cured meat that has been improperly stored. Proper refrigeration helps to inhibit germination of the spores, so it is important to store cooked sausages in the refrigerator. Trial 1: I simply set the sausages on a rack, which went over a sheet pan and stuck the whole lot in my office. When I checked on them the following day, they seemed to have lost some moisture. By the second day, they had become noticeably drier but when I tested for sourness, they were no where near where they should be. It was clear the air was too dry and I'd need to take corrective measures. I put the rack over a pan of water so that the links were about 3 inches above the water. I also got into the habit of flipping the sausages every once in a while. I let the process go for a total of 6 days at about 60F. I think the initial water loss compromised the texture a little, but it wasn't bad for a first try. Trial 2: I set the sausages on a rack set over a pan of water and rigged a loose dome-shaped covering over them to keep the environment adequately humid. I didn't want them to dry out too soon. I checked them everyday and they seemed to be doing fine. Since it took 6 days the first time, I checked for sourness after 5 days. This is when I noticed a small spot of white mold on one of the links. I was a little worried the sausages would be ruined, but since the weren't giving off any weird smells, the meat inside was still pink and otherwise looked fine, I tested one. It tasted fine. Very good, in fact. I just ended up throwing away the one link and froze the ones I wasn't going to cook immediately. This is how the sausages looked after 5 days (Trial 2). But wait, I'm not quite done yet! As I've said before, there is more than one way to skin a cat. 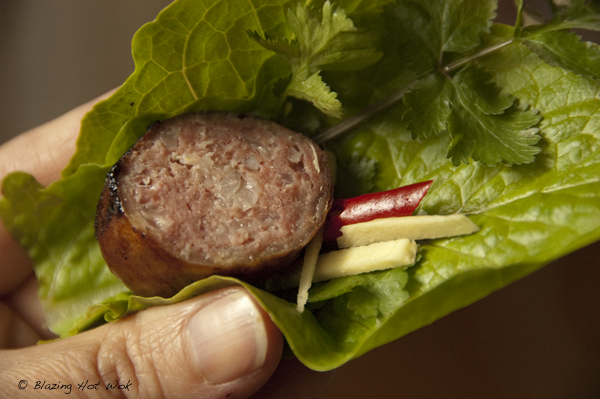 One alternative method to ferment Isaan sausage is to use a commercially available starter culture. The main advantage seems to be a reduction in fermenting time. You'll still need to use the pink salt, however. If you are interested in going the starter culture route, check out A Hunger Artist's post (in collaboration with She Simmers) about fermenting Isaan sausages using Bactoferm LHP. If you've read this far, thank you! The end is near! There's a recipe at the end of the paragraph! Since posting the original recipe, I've played around with it a bit and what I'm giving you now is the formulation I used to work out the fermentation process. The main differences are the addition of pink salt and a little sugar. I used 1 gram pink salt per pound sausage. The sugar helps to kick start the fermentation process as it's the preferred energy source for most bacteria. Don't go replacing it with a sugar substitute like Splenda. Just like humans, the bacteria can't break it down. Combine the meat with the back fat and grind them together. If you use a meat grinder, make sure both are super chilled, semi-frozen. For these sausages, I like to use the coarse blade. The meat can also be ground using a food processor. Dissolve the salts and sugar in the liquid and add it to the meat. (If it doesn't go into solution, you can heat the liquid, but it must be refrigerator cold when you add it to the meat.) Add the remaining seasonings and cold rice. Mix the sausage. I recommend doing it by hand because it gives a better texture. Before stuffing into the casings, take a small bit and taste test it (not raw, cooked!). Adjust the taste by adding more kosher salt, if necessary. If you have a curing chamber, hang the sausage in there. Sixty to 70F seems to be the proper temperature range. As for the humidity, I can't give a number, but the sausages should not dry out too quickly. So if you see this happening after a couple of days, up the humidity a little. After about 3 or 4 days, you should cut a test piece to taste for sourness. If you're happy with the result, you're done. It's unlikely to take more than 5 days. I recommend freezing what you won't eat immediately. If you don't have a curing chamber, there's going to be a little more babysitting involved, but nothing too complicated. Put the sausages on a rack and place them over a pan of water. (You might not need the water if you live in a humid climate.) There should be at least 3 inches of space between the sausages and the water. Place them in a spot out of direct sunlight and away from strong drafts, like an air vent. Do make sure there is ventilation, though. I put the sausages in my office and closed the air vent. That seemed to be enough ventilation. You should inspect the sausages daily to make sure they are not drying out and to inspect for mold. As I said, I found a small spot of white mold on one of my links, but it didn't appear until the last day. I simply removed the offending link. If you are at all feeling unsure about the quality (safety) of your sausage, just throw it out. This hurts and it's going to feel like a big fat waste, but better to be safe than sorry. Yay! You've reached the end! So tell me, was this helpful? Have questions, concerns or advice? Leave a comment. I'd love to hear from you. Marriott, NG and Graham, PP. 2000. Some Solutions to Difficulties of Home-curing Pork. Blacksburg, VA: Virginia Cooperative Extension, Virginia Tech University. "Molds on Food: Are They Dangerous?" USDA Food Safety and Inspection Service.